Norwalk’s Ashley Wilson drives to the basket against Hamden defender Makaela Johnson during their Class LL semifinal Monday. In the CIAC Class LL semifinals it was junior Belinda Hunte with 18 points and senior center Naeva Rene with 16. In the quarterfinals, freshman Serenity Mayhew led the way with 12 with senior Ashley Wilson scoring 11. Sophomore Jakara Murray-Leach was the MVP of the FCIAC tournament after leading in scoring in the semis and finals. 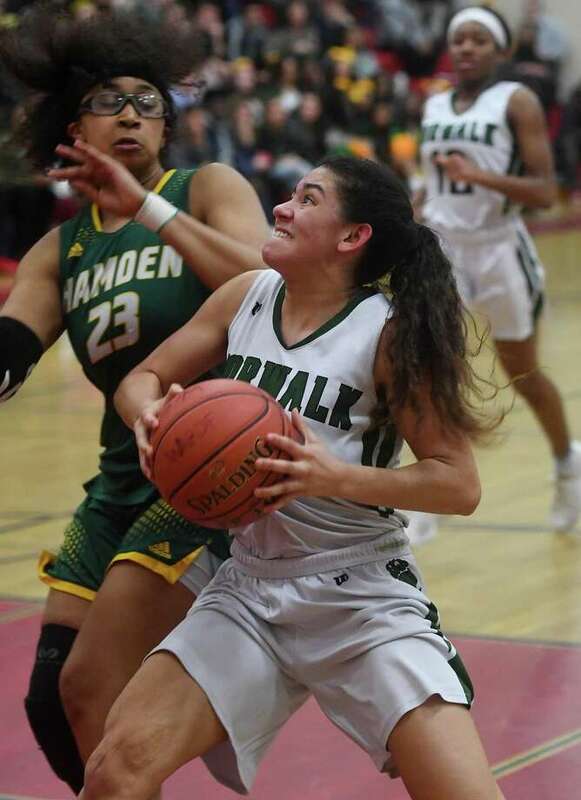 The point is, Norwalk does not have one superstar it turns to when it needs points but rather a collection of talented players willing to do their jobs on any given night, and if the points fall to them, so be it. That balance has the No. 1-seeded Bears on the cusp of completing an unbeaten regular season. Norwalk will face No. 2 New London in the CIAC Class LL championship game Saturday at 3 p.m. at Mohegan Sun in Uncasville. The team is anchored by the senior trio of Wilson, Rene and Sanaa Boyd, with underclassmen filling in around them. Having talent among the younger players has made the seniors’ jobs easier this season. The team spreads around the ball but also put forth a tremendous team effort defensively with all the players buying in to the program on that side of the ball. In the semifinals that meant holding in check Hamden’s D-I duo of Taniyah Thompson and Makaela Johnson, which the Bears did with aplomb. The heart of the defense is Boyd, who checked Thompson, holding her to 10 points. While Fuller knows the team is succeeding because of the depth across grades, it is the seniors making the most difference. Being named most improved player every year is an acknowledgment of the hard work Rene has put in during the season and in the summer with her AAU coaches. If all the Bears do their job for one more game, the team will bring home the first state title in 19 years.